Elsewhere on this website, William Galston advised the Romney campaign to make an all-out push for Wisconsin, Paul Ryan’s home state, in hopes of providing alternative paths to victory in the event of defeat in Ohio or Virginia. Certainly, Romney would be served well by Wisconsin’s 10 electoral votes, and it is easy to envision scenarios where a win in the Badger State interrupts Obama’s path to victory. But going-all out in Wisconsin might be choosing the path of most-resistance. Indeed, Wisconsin could be Obama's best battleground state and it might be the only battleground state where Obama has nearly locked up the votes he needs to win reelection. Although the state remains characteristically tight, post-debate polls show Obama at or above 49 percent—just like 21 of the 23 surveys conducted in the Badger State since the gubernatorial recall election, and a higher percentage than any other battleground state. No, there haven't been many post-debate polls, but the post-DNC surveys showed Obama leading by 7 points--better than any other battleground. Similarly, the Wisconsin Recall exit polls found Obama leading Romney by 7 in a very Republican-friendly electorate. This isn't to say that Romney can't win Wisconsin, just that he appears likelier to win in most of the other battleground states where at least a few polls show him in the lead and Obama holds less than 49 percent of the vote, including the pivotal state of Ohio. The polls are not alone in viewing Wisconsin as less competitive than the other battleground states; the campaigns might believe it too. 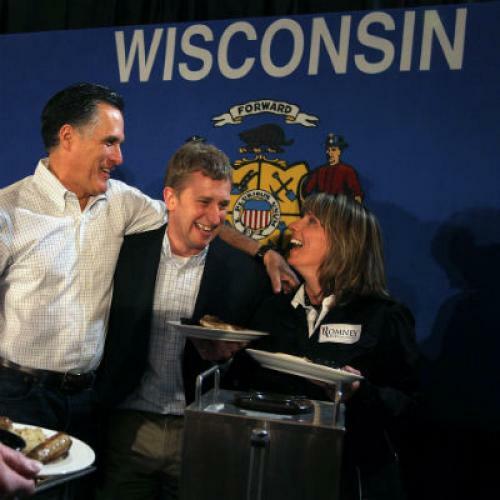 The Obama and Romney campaigns kept Wisconsin on the back-burner throughout most of the summer and didn't invest in the state until a week following the major party conventions. The Obama campaign even chose to initially spend dollars defending Pennsylvania instead of Wisconsin. And in September, the Obama campaign was content to allow Romney to out-advertise them by more than 2:1 in western Wisconsin, despite the resources to fight on a level playing field in inexpensive media markets. While this might be surprising given the state's demographics, it's less surprising given it's electoral history. In 2008, Obama won Wisconsin by more than 16 points—more than any other battleground State. Wisconsin has voted for Democrats in six consecutive presidential elections and it's the only battleground that never voted for George W. Bush. These aren't reasons why Romney can't win Wisconsin, just reasons why it's more difficult than the other battlegrounds. In 2008, McCain made a last-ditch gambit to take Pennsylvania. His shot at the presidency was all but gone, yet the state was large enough for the effort to pay off if the election ever tightened up. But Wisconsin is only worth 10 electoral votes, so Obama would still have plenty of opportunities to win the presidency if Romney snatched the bluest of the purple states. If Obama won Ohio but lost Wisconsin (an unlikely scenario, in my view) Romney would still need to sweep Florida, North Carolina, Colorado, and Virginia. Then, Romney would need an additional win in one of Nevada, Iowa, and New Hampshire. While running the table in three states might seem tough for Obama, there's reason to think that he's well positioned in all three states compared to the country, and perhaps even in comparison to Ohio. The new voter registration numbers suggest Romney faces a daunting climb in Nevada, while the pre-debate polls looked just as good for Obama in Iowa and New Hampshire as they did in Ohio or Nevada. Once again, history seems to augur well for Obama: all three states tilted Democratic with respect to the country in 2008. If all three of the states appear to tilt toward Obama, then a Romney win in Wisconsin would not secure enough electoral votes to block Obama's route to victory through Ohio. Conversely, the case for going all-in for Wisconsin would strengthen if Romney made big gains in New Hampshire (which is hinted at by some post-debate polls) and coupled it with a bigger effort in New Hampshire, but it's a state where the Romney campaign isn't spending nearly as much as Obama. Without Ohio, Romney’s path to the presidency gets quite narrow. An unlikely win in Wisconsin would open up Romney’s route, but breaking into the Badger State could be more challenging than a victory in Ohio and Obama could make up for it with three states that appear to tilt his way. If relentless focus on Wisconsin could get the bluest of the red states into Romney's column, then perhaps the Romney campaign should relentlessly focus on Ohio--a larger state with a history of leaning toward Republicans where a few polls show Romney in the lead and even fewer show Obama above 49 percent of the vote.